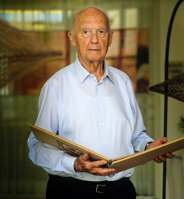 Elusive Justice: The Search for Nazi War Criminals premiered November 2011. An examination of the more than six-decade global hunt for Nazi war criminals. At the end of World War II the Allies declared the Nazi party a criminal organization and vowed to prosecute and punish the architects and triggermen of genocide. It was an ambitious pledge: several hundred thousand Gestapo, SS and Wehrmacht forces had engaged in war crimes and atrocities against civilians. However, only a few thousand Nazi war criminals and collaborators were convicted at the Nuremberg trials, held from 1945 to 1949. The vast majority evaded prosecution by concealing their war records, assuming false identities, fleeing Europe, or serving Allied governments as spies or scientists. While smuggling Holocaust survivors from Austria to Palestine, Asher Ben Natan organized and funded Nazi hunting operations in Europe. In the absence of a sustained international manhunt and centralized prosecution, the task of bringing Nazi war criminals to justice was undertaken by a handful of individuals — acting without official status or government support. These so-called Nazi hunters collectively identified and brought to justice thousands of Nazi war criminals. Simon Wiesenthal may be the most famous Nazi hunter, but Elusive Justice focuses on individuals whose names are less well known and who helped capture and convict the architects and engineers of genocide, mobile killing squad officers, concentration camp guards, industrial slave drivers and medical experimentation staff. In the process, these Nazi hunters gave a measure of dignity to the dead and reminded the international community that enemies of humanity must be punished if humanity is to survive. The legal protocols developed by the Nazi hunters are still being used to extradite and indict the perpetrators of war crimes that continue to plague the world, including most recently in Rwanda, the Balkans and South Asia. Narrated by Candice Bergen, Elusive Justice is an unprecedented examination of the more than six-decade global hunt for the 20th century's most notorious war criminals, thousands of whom are still presumed to be alive. Featuring intimate portraits of the Nazi hunters, the film also examines the nations and institutions that helped bring war criminals to justice or, in too many cases, helped them to escape. was produced by Saybrook Productions Ltd. The Blavatnik Charitable Foundation; The Rita J. and Stanley H. Kaplan Foundation; Jeffrey and Mary Werbalowsky; The Arthur and Eileen Newman Family Foundation; The Friedman Family Charitable Trust; The Shanken Family Foundation; Metropolis Productions, Inc.; Fried, Frank, Harris, Shriver & Jacobson LLP; Miller Buckfire & Company LLC; The Preiser Family; Paul Singer; The Blanche and Irving Laurie Foundation; Joesph and Diane Steinberg; The Jay and Jeanie Schottenstein Foundation; The Klarman Family Foundation; The Nash Family Foundation; The Oster Family Foundation; The Kekst Family Foundation; The Eleanor Siegler Family Fund; The David Berg Foundation, Inc.; Ocean Ridge Capital Advisors LLP; Steven Mark and Joy M. Zelin; The Hecktman Family Foundation; Ted Bigos; The Rubin Family Charitable Trust; The A. S. Hochberg Revocable Trust; Richard and Linda Robin; Avy and Marcie Stein; Holt’s Cigar Company; George and Diane Fellows; Sigmund A. Rolat; The Jewish Communal Fund; Robert A. and Dan L. Hamwee; Tina L. and Andrew P. Brozman; Catherine M. Klema and David L. Resnick; Murray and Louise Pantirer; Christine P. and Joseph W. Swanson; John W. Sinders Jr.; The Julie and Martin Franklin Charitable Foundation; The Kirkland and Ellis Foundation; Stroock & Stroock & Lavan LLP; Saul Burian; Kenneth and Ruthann Eckstein; The Carl Marks Foundation Inc.; David Issac; The Quadrangle Group Foundation, Inc.; Lisa Beckerman; The Friend Family Foundation; Matthew I. Rebold; The T. and C. Schwartz Family Foundation; The Michael and Holly Zimmerman Foundation Inc.; The Tina and Steven Price Charitable Foundation; Donald G. Dunkelman; Eduardo Elsztain; Edward Weisfelner; Alan B. Levin; Foundation Q; Avenue Capital Management LP; The Sheifer-Zimmerman Family Fund; Stephen D. Oppenheim, Esq. ; The Nash Family Foundation; The Atlantic Trust; The Victor and Monica Markowicz Charitable Trust; The Abramson Family Foundation; David Fox; Mr. and Mrs. Richard Wynne; David L. Kuniansky; Alexander and Jill C. Dimitrief; Kalman Kushnir Capital Inc.; David Halpern; The Paul and Karen Levy Family Foundation; Dr. Felix and Ruta Zandman; William Leavitt; Jeffrey R. and Andrea G.;Weiner; David N. Weinstein, Esq. ; Ellen Trachtenberg; The Dennis Berman Family Foundation; The Lynne M. and Howard I Halpern Family Foundation; Charles J. Rose and Beatrice Schreter; Ethan B. and Cynthia Z. Charas; The Belz Foundation; The Sapirstein-Stone Weiss Foundation; Dennis Ivan Simon; Jeffrey S. and Evelyn L. Sabin; Barry N. and Gretta G. Seidel; Robert H. Scheibe; Bruce J. and Iris Klatsky; Shai Waisman; Sylvia Moss; Samuel L. and Vicki E. Katz; Alan D. and Jill M. Holtz; Joshua C. and Rebecca Cascade; Alexander D. and Lori S. Greene; The Lori and Mark Fife Foundation; The Jewish Community Federation; Richard M. Born and Deborah H. Born; Judd A. Weinberg; Niv and Kim Harizman; Andrew B. Miller; J. Simmons; Gavin D. Solotar; Patricia P. and Joseph J. Lynett; Joseph M. Kaplan; Zachary B. and Daphne Viders; William S. Katchen; Scott L. and Lorraine Hazan; Goldin Associates, LLC; Myron and Harriet Trepper; Marc Abrams; Keith Jon and Cari Heather Kaplan; Andrew and Laurie Fishman; Mr. and Mrs. Matthew Cantor; Michael and Stacy Greenberg; Mitchell and Laura Kall Felton; The Belz Foundation; Stuart and Susanne D. Hirshfield; Lori Lapin Jones; Todd W. and Melissa J. Arden; The Schwab Charitable Fund; Susan Glick; Robyn Freedman Spizman Literary Works LLC; Bella Solnik; Geraldine Bolger; Varda E. Sandweiss; and Steve and Melinda Wertheim. © 2015 Saybrook Productions Ltd. All Rights Reserved. Photos courtesy of Jonathan Silvers.